Nepal is a land locked country surrounded by China in North and India in South, East and West. The elevation ranges almost from 60m to 8848m, the highest peak of the world, Mount Everest (Mount Sagarmatha) Out of 14 peaks with more than 8000 m high of the world, 8 peaks are in Nepal. Geographically, it is located between 26 degree N to 31degree N latitude and 80 degree E to 88 degree E longitude of the globe. The length in the east-west direction is about 885 km. and the width in the north-south direction varies between 145 km to 245 km. The area of the country is 147 181 sq. km. Depending upon the elevation, the country is divided into five physiographic regions namely: Terai (Plain area) 60-300 m, Siwalik Hills 200-1500m, Middle mountains 800-2400m, High mountains 2200- 2400m,and Himalayas 5000- above. The population of the country is about 23.5 million and the majority of the people reside in rural areas with diverse cultural heritages. Due to a wide variation in the topographical characteristics different climatic variations are available in Nepal. Accordingly, Nepal offers tropical, sub tropical, temperate, and alpine and sub artic types of weather depending on the elevation. The mean temperature is about 150c, however summer temperature reach over 450c in some places in the Terai. Due to rugged terrain annual rainfall varies greatly from place to place from 2400mm to 5000mm. About 80 % of the precipitation occurs during the monsoon season from to June until September. The country is heavily dependent upon weather conditions even for basic food supplies. Nepal is not only landlocked but also lacking substantial resource for development because of its geographical features. The Great King Prithvi Narayan Shah unified the country by joining the small-small states into one single country, Nepal on 1786BS. Since then the Shah dynasty is ruling the country. However, from 1846 to 1950 about 104 years of period, the Rana Prime Ministers ruled it. On 1950, with the joint movement of the then King and the public, democracy was established in the country. On 1961, the king then took over the absolute power and dismissed the elected government and Panchayat system was exercised, the system lasted for about 30 years. Once again, there was a public movement on 1990, the king then pronounced the establishment of democracy, since then multiparty democratic system is restored in Nepal. At present, King Gyanendra Bir Bikram Shah Dev is the Head of State. As per the constitution of Nepal 1991, it has three independent bodies namely: Legislature, Executive and Judiciary. Legislature looks after the job of actually governing the country, making laws and Bills and overseeing the finances of the country. This is done by Parliament, which consists of His Majesty and Upper and Lower House. The Executive's job is to actually carry out the government of the country as decided by the Parliament. His Majesty and the Council of Ministers, which is also called the Cabinet, exercise the power of this function. The function of the Judiciary is to ensure justice, according to the law and there are three levels of court namely Supreme Court, Appellate Court and District Court. Kathmandu is the capital of Nepal. Administratively, Nepal is divided into 5 Development Regions, 14 Zones, 75 Districts and 3396 Village Development Committees and 58 Municipalities. The development of cadastral system in Nepal is very gradual. Although the land recording system is very old in Nepal, only a few decades have been elapsed since the systematic cadastral system was developed. However, there exists, one way or another a certain uniform system throughout the country. The rudimentary land registration system was based on verbal descriptions and there exists some very primitive method of measuring a parcel. For example, the size of a parcel is defined by Hale, Pate, Kodale, Kute etc. In 1965, Cadastral Mapping along with the registration of the parcel was also launched side by side to support Land Reform Programme. Consequently, a detailed land recording system was established and based on these records, the government raised land revenue. This programme was terminated on 1997 after completion of cadastral survey of the country. Initially, the cadastral survey was carried out with local control system and this system was applied for 38 districts, the maps thus produced are also termed as island maps. After establishment of Geodetic Survey in Survey Department in 1973, a network of national control system was established and so the remaining 37 districts, the surveying was based on the national control system. Therefore, the government decided to resurvey those remaining 38 districts that are not based on the national control network. At present, resurvey is in progress mainly in 9 such districts of Terai area (plain lands) including Kathmandu. Recently, a concept has been developed to prepare a parcel plan individually and also to carryout the survey using Total Station Theodolites. The reason is to reduced the number of disputes, to increase the accuracy of mapping and to support the establishment of parcel based cadastral information system. Survey Department works under the Ministry of Land Reform and Management. The other Departments of the Ministry are Department of Land Reform and Management, Department of Land Information and Archive and Land Management Training Centre. Besides, Guthi (Trust) Corporation is also one of the organization belongs to the Ministry. Survey Department has three Branches namely Geodetic Survey, Cadastral Survey and Topographical Survey Branches. Furthermore, the department has 83 Survey Offices in 75 districts, where there is at least one office in each districts. The Cadastral Survey Branch has 9 mobile Survey parties called Goswaras. The Goswara conducts the Cadastral Survey and after completion of mapping work in the district it hand over the field books and maps to Survey Office of the district and other related documents (Srestas) to District Revenue Office of Department of Land Reform and Management. Private Sector such as consulting firms, sometimes, perform cadastral mapping, however, the documents has to legalize after checking and inspection from the Survey Department. So the private firms feel that it is not an easy approach and they are not motivated in this field. At present, there are two professional organizations related with the cadastral system in Nepal namely Nepal Surveyor Society and Nepal Surveyor's Association. These organizations are presently concentrated mainly to maintain the professional rights, to publish regularly the professional magazine and to conduct national conference. On 2050, Nepal Surveyor Society conducted a conference on cadastral, the resolutions adopted by the conference was recommended to His Majesty's Government for the implementation. First attempt in Land (survey & measurement) Acts 1999 (Eight Amendments) has a provision to award License to qualified Surveyors, but it is not yet applied due to lack of rules and regulation regarding the process, qualification of the surveyor, terms and conditions to honor the license, etc. It is expected to start the system as early as possible. Land Management Training Centre of Ministry of Land Reform and Management conducts 3 levels of training, namely: Basic Survey (SLC Candidates), Junior Surveyor (I. Sc. candidates) and Senior Surveyor (B. Sc. candidates). Few years back, Government decided to give authority to Private Sector to conduct basic Surveyor course, accordingly, at present, there are 5 such institutes where basic Surveyor course conducts. Tribhuwan University, Nepal is working to open the Graduate Course in Surveying. This course being realized very important, the reason is, at present, scholarships to go to abroad for such courses are not available and the person do not go with self-finance in this field. So, if there is no promotion of education in this sector, the surveying profession will, in near future, face crisis in skill human resources. The cadastral system in Nepal basically commenced to collect land revenue for the Government by identifying the landowners and its tenants. Later on, Cadastral Survey was performed to support land reform programme of the Government. The allocation of revenue amount is based on the area and type of the parcel. The type of the parcel is depending on the various facilities available as indicated in Land Survey Rules and Regulations, 2058. Therefore, Cadastral Survey was carried to identify the landowners, tenants and to determine the types of land. Finally the Owner Certificate is distributed to the concerned owners after fulfilling the necessary formalities. The cadastral information, in the beginning were mainly used only for fiscal purposes that is land revenue and land administration activities, but due to lack of other legal and more informative documents these were gradual used for legal and multipurpose functions. The data contained in the cadastral system is working as fundamental data set for many users. The development of the computer based land information system, it will support to derive a multipurpose cadastral system for various land related activities such as land management, land development, land valuation, land taxation, planning and local governance etc. by computerization of spatial and textual data of the system. A parcel is a property and is defined by the act. The classification of parcels is also carried out as per the guidelines given in the Rules and regulations of Land Survey 1999 as rural and urban parcels. For the land administration the following land types are defined namely: public land, Government land, Forestland, Private land, barren land. The assets in the parcel are also included in the property. There are no different types of cadastre for different purposes. In Nepal, registration of deeds system is being applied in which the responsibility in land transaction is solely depends on the landowners and there is no liability to the Government side, if there exists any discrepancies in the parcel. In deed, the illegal or informal settlements create problems, but there is no any provision to be settled by act. This is the burden of the government to remove them from the encroachment but some times the cabinet forms high level commission to distribute the land which is not legal but happening. Cadastral system in Nepal is treated as part of the land administration process and does exist district-wise. In general, cadastral mapping, preparation of related document and the registration of the parcel are performed by the Goswara (survey party), Cadastral Survey Branch, Survey Department. After completion of the Survey, the cadastral maps and field books are handed over to the district Survey Office and the related textual documents (Sresthas) are handed over to District Land Revenue Office of Department of Land Reform and Management. The Survey Office updates the maps as per the decision made by the Land Revenue Office. The instructions to Survey Office will be as per the demand from the concerned landowner during land transaction and land fragmentation. The Land Revenue Office will update the textual document. Whereas, if the transaction of a parcel is from one owner to another without being change in the status, there will be no information to the Survey Office, which at present felt that the document in the Survey Office also need to be updated accordingly in such situation. Cadastral Maps- The graphical cadastral maps at the scale of survey that are identified by the systematic map sheet number and included main features in the parcel. The details of the contents are described in topic D.
Land classification, land type, crops, irrigated or non irrigated land, area of the land parcel etc. Land Ownership Certificate- Two copies of land ownership certificate are prepared, the official copy is termed as Jagga Dhani Sresta and the second copy is termed as Jagga Dhani Purja and is distributed to the concerned owner. The details are copied from the field book. File Maps- During the process of land transaction when the parcel is too small and if it is not possible to plot in the map after fragmentation of the parcel, a file map of this parcel will be prepared in a separate sheet in larger scale. Plot Register- Plot register is an information of each parcel which has been fragmentation. The main information in the plot register are the newly established parcel numbers along with the mother parcel number, the area of each fragmented parcels and how the parcels has been fragmented. At present, the concept to convert this graphical and textual information into computer based digital form has been developed. The system has been applied in two of the districts of Nepal in order to support the establishment of Land Information System. A seamless DCDB and DTDB is future dream of the country like Nepal is becoming essential for accurate decision-making. All private lands are freehold. Public and government lands are also registered. The current cadastral maps are prepared graphically. The cadastral surveys are carried out in three different scales 1: 500, 1:1250 and 1:2500 based on the nature of the terrain and value of the land. A team of members from Geodetic Survey and Cadastral Survey Branches usually decides the scale of the survey. Accordingly, the control surveys are carried out and the map sheets are prepared. 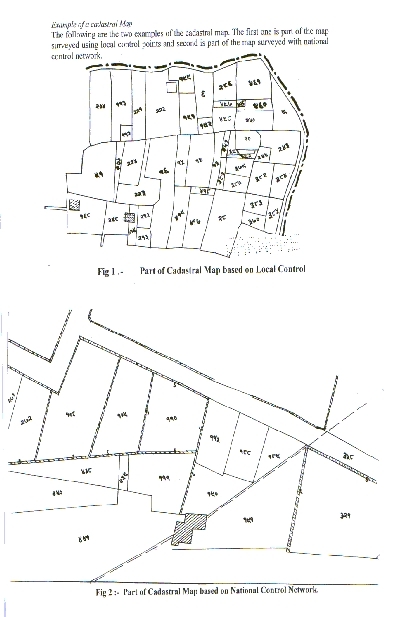 The Goswara of the Cadastral Branch performed cadastral mapping using traditional plane table survey method. The map contents are the parcel boundaries, parcel numbers, roads, rivers, houses, well, spout, canal and its distribution, content of map etc It consists of parcels with unique ID, Geo. control points, administrative boundaries, main features or objects like building, walls, fence, roads, railways, telephone line, power lines, water bodies, vegetative (forest, plantation), public services (parks, temples, post office, hospital, school etc). In the present context of SDI environment, the contents in the cadastral map need to be revised to support the system. The maps are in continuous update status as per the parcel fragmentation and land transaction process. The updating is carried out by the District Survey Offices of the Survey Department as per the instructions received from District Land Revenue Office. Official letters to district and local administrative units/government related offices line forestry trust corporation as its local offices and so on. Adjudication and surveying and land classification at once. Owner's name with relevant attributes. Tenants name with relevant attributes. Area of the land parcels. Land use and other attributes. Notification of all the details for any claims. Registration of land parcels with restrictions mortgages and easement if any. Setting of the disputes or claims. Preparation and distribution of land owner certificates. Preparation of others records and statistical cadastral records. Handing over the records to the relevant district offices for the continuous updating that is Land Registers (copy of certificate) to the district Land revenue office and cadastral maps, field books, Area forms and others to district survey office. In Nepal, the importance of cadastral information was realized when the concept of land information system was developed. So, the development of Spatial Data Infrastructure has recognized to link the cadastral information as a fundamental layer for the land information system. In order to support this system, in some of the districts, the digital database of the cadastral maps has been prepared by scanning and vectorization process. Furthermore, the related textual data are also processed to transfer from hard copy in paper to digital form. Hence, consequently, a database on cadastral information will be established which will then be used mainly for broader sector of social, environment, economic and good governance activities of the country. As stated earlier, the cadastral system was started to collect the land revenue and to support land reform programme and hence the reliability part of the system was neglected. So, the survey was carried with very low skilled and less qualified technicians. Secondly, local control system for mapping was used and, therefore, each map sheet has its own system, orientation and accuracy. Consequently the edges of the map do not match with that of adjacent sheets. As mentioned earlier, there are no universities and colleges in Nepal for academic degree of professionalism ethics and seriousness on the job. When the people become aware in the context of importance of the cadastral information for their daily life, Government realize that the accuracy of the cadastral map are not to the expectations of the people. Therefore a policy has been developed to resurvey using national control network where the cadastral survey was carried out with local control system. During resurvey process in these areas, the word verification (used to called as "Vidaune") of existing document was misinterpreted in all levels of staffs, it lead to the surveyors to manipulate the maps to fit with the existing map. Consequently, this again led to number of issues especially in the finalization of area and registration of the parcel. In Nepal, there are more than one organizations related with the land administration activities, which lead to the non-uniformity in the land administration, land related documents scattered over the different places, difficulties in updating the documents, wastages of resources, etc. The Survey Department, Land Reform and Management Department, Commissions constituted by cabinet, trust corporation. Launch programme to provide awareness in the context of participation of the people concerned in the process of cadastral mapping. Resurvey the districts using national control network systems where the local controls were used for the mapping. The qualification of the surveyors had been upgraded in 1975 and again to upgrade one more steps is in process to provide them a better responsibility. A team of members is constituted to define properly the word verification of the existing document so that it will not mislead the technician and administrator concerned in the process of mapping and in the land administration. It is expected to get the report from the team as soon as possible. The process of adjudication will be improved in near future. Discussion is in process to reduce the number of organizations related with land administration and trying to develop a system to coordinate these organizations and to integrate and consolidate the document in one of the organization.